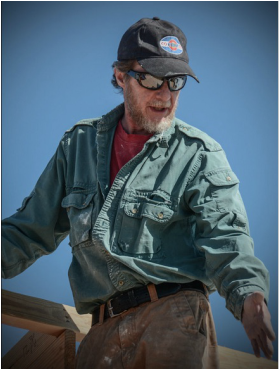 John is a hemp builder and lecturer based in northern Colorado, USA. A carpenter and furniture designer by trade, his inspiration to build with hemp came from veteran hemp builder Steve Allin of the International Hemp Building Association. John also has worked on commercial and residential building projects, has researched sustainable living methods since the 1970s, and is specially trained in residential building envelope and fenestration installation. In 1997 John designed and built his own off-the-grid home complete with its own solar-based electricity plant. Owned Jack Herer’s Book The Emperor since 1999. Cultural Trip by bicycle to Italy, Holland, Belgium, Luxemburg, United Kingdom. Renovated historic Victorian Manor into a commercial coffee house. Managed several commercial and residential construction projects. Hosted Steve Allin author of “Building With Hemp” in my home for seven days. Taught 2 day hempcrete workshop with 25 attendees. Steve Allin, International Hemp Bldg Assn.